Our training programs provide delegates with ample opportunity to practice their new skills throughout the learning process. South African clients can gain Continual Professional Development (CPD) points as required to maintain your professional registration status with the Engineering Council of South Africa (ECSA). Please contact us for the latest training schedule. These costs apply to our Cape Town head office. Please add R500 per day (ex VAT) for training in Johannesburg and outlying areas. The above courses can be conducted online at R3300 p/day. To complete the above courses online please contact us to arrange a schedule. Completing the Proficiency Course is a prerequisite before booking a place on the Advanced Course. For the above courses, please download the training pack which includes the registration form and course contents. Download the Training Pack here. The online Introductory Course is conducted by one of our industry experts and is designed to get you up and running with your project quickly and efficiently. The course allows you to familiarise yourself with new features including Drawing and Modifying, Handling External XREFs, Utilising Viewports, Plotting & Production Drawings and Rendering. You can also request specific content that you	would like to cover in the session. How is the online training conducted? 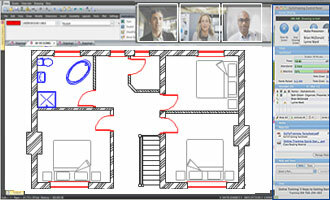 The training link launches a GoToMeeting screen sharing app in your browser allowing you to interact with the presenter in real time and see his screen. You can follow the course using your installation of AllyCAD. We recommend that you have two screens for this purpose. How do I join the training session? An invitation link sent to you via email allows you to participate in the event. It's that simple. In order to follow the presenter's instructions it is advisable to run the same version (8.2). It is also possible to follow the training in the student version of the software. If you have questions regarding the online training please email info@allycad.com. The online introductory course (approx 3 hours) costs	ZAR 2,300 (approx GBP 125) and is scheduled according to demand. Please contact us to arrange a time slot that is convenient for you and then use the PayPal button below to pay for and confirm your booking. If you are a South African BEE client, you may be unaware that you can apply to the Department of Trade and Industry (DTI) for a cash grant for business development services aimed at improving core competencies. Because our training courses qualify as business development services, you would be able to obtain a cash grant to fund them.